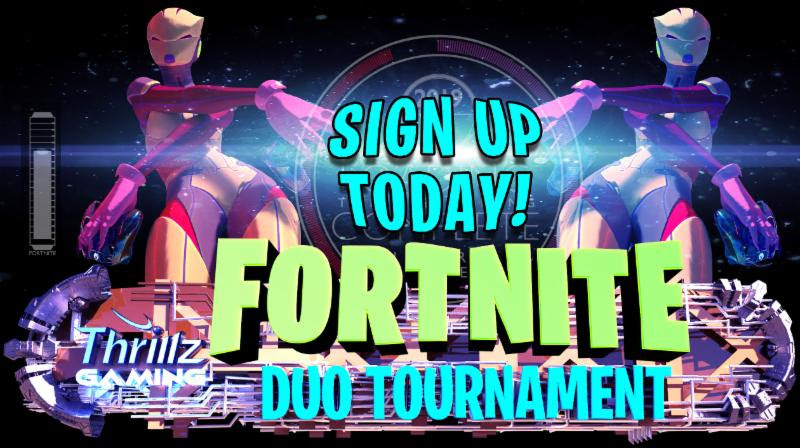 Partner up before the tournament! 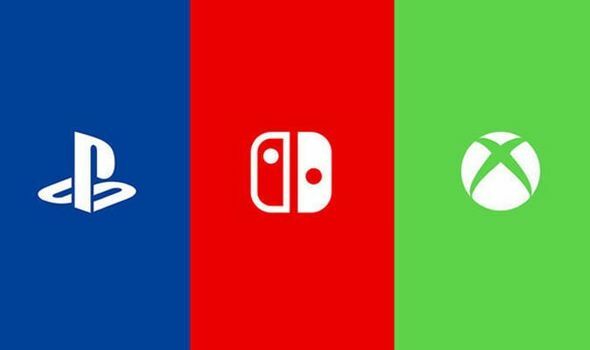 We will assign partners to single players. 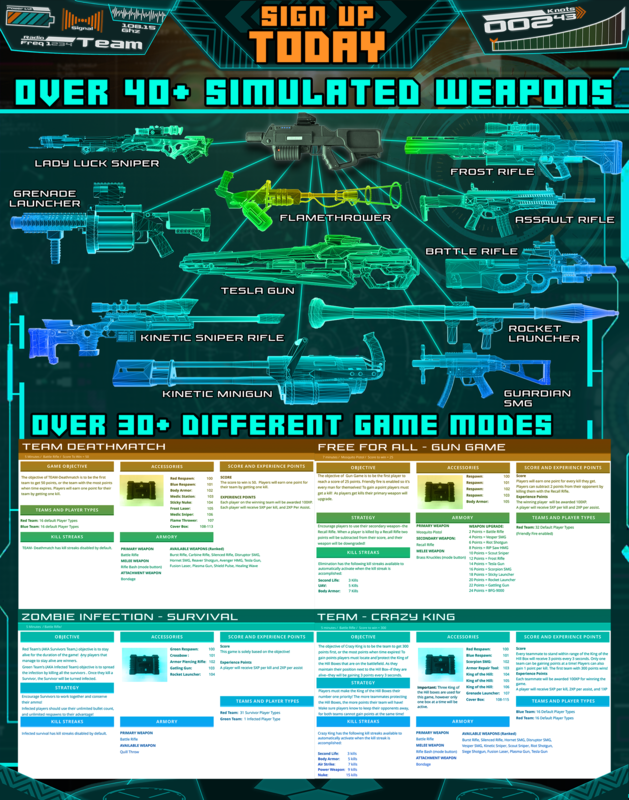 You are guaranteed at least 2 rounds. The order of the teams playing will be determined on the night of the tournament. ALL EQUIPMENT WILL BE PROVIDED BY THRILLZ. Outside equipment will not be permitted. 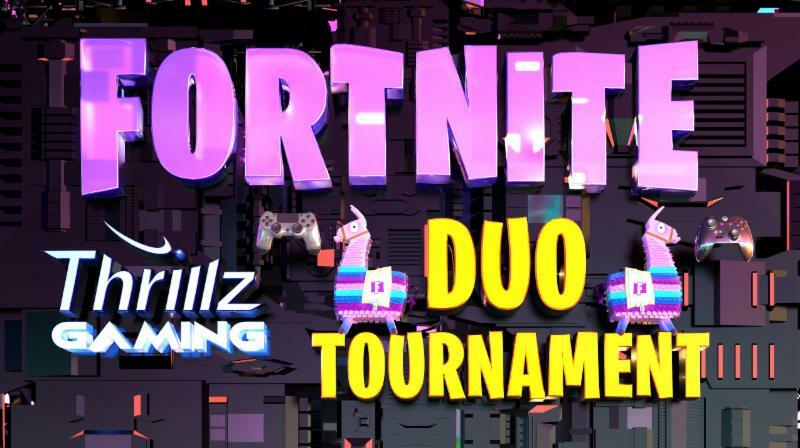 Fortnite accounts will be provided by Thrillz. Check-in at the Thrillz front counter (Friday April, 26th starting at 5:00pm). Thrillz and Bounce waivers must be in our system to receive a Universal Wristband for tournament. 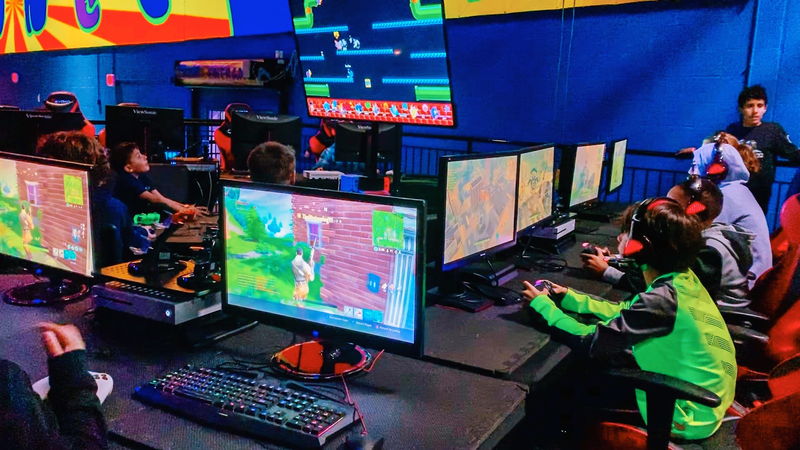 When purchasing tickets you will be prompted to fill out information including participant(s) and their preferred gaming platform (Xbox, Playstation, or keyboard & mouse). Socks are mandatory for the event. Bring your Thrillz or Bounce socks! Socks are available at Thrillz for $2. Each team will play 2 separate rounds, and the best scores will be used for seeding the top 6 teams for playoffs.  We provide Xbox and Playstation systems, as well as keyboard and mouse support on console. We apologize but no outside equipment including laptops or PC's. You will need both Thrillz and Bounce waivers to participate. You can find the waiver for Thrillz here , and the waiver for Bounce here. 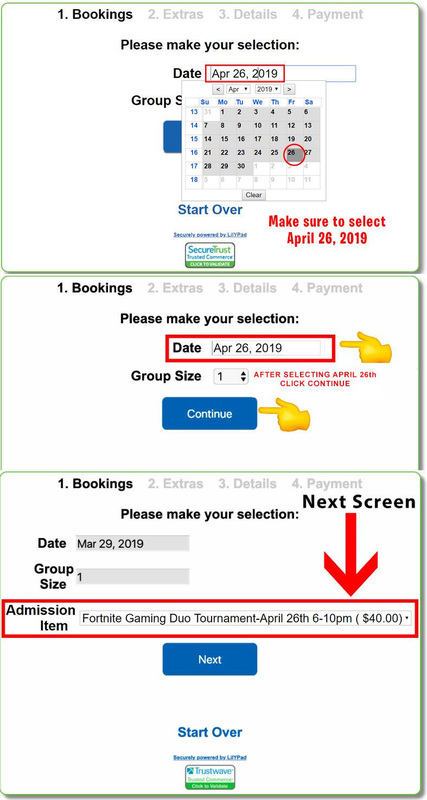 If you are having trouble navigating the link to the tournament, make sure you select (April 26th, 2019) to buy your ticket. The instructions below may help. Check-in at the Thrillz front counter (Friday March, 29th starting at 5:00pm). 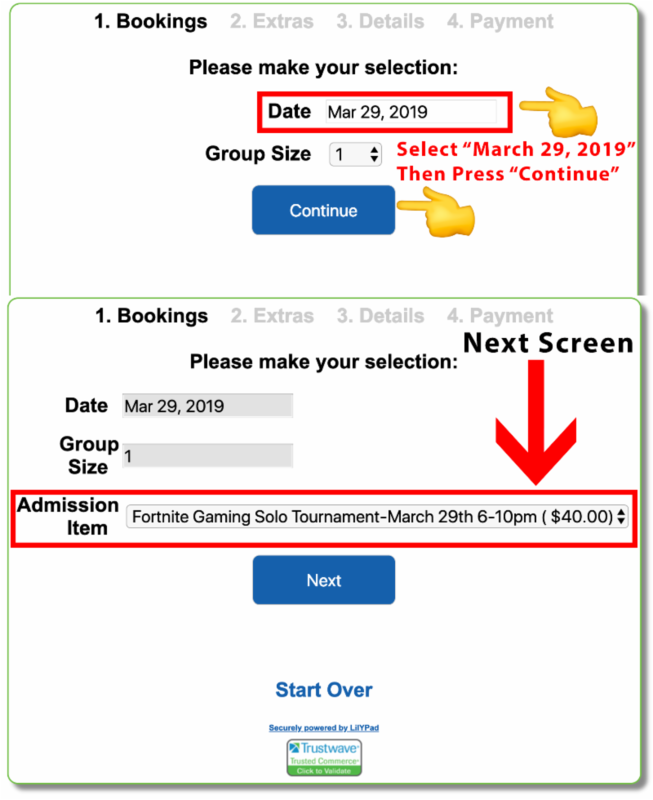 If you are having trouble navigating the link to the tournament, make sure you select (March 29th, 2019) to buy your ticket. The instructions below may help. Want to hear the latest news and specials? sign up below! Please call in advance to reserve your spot - Walk-ins welcome based on availability.